On May 1st, in Detroit, he went to see McCarthy in his hotel room. Gehrig was McCarthy’s favorite; he loved him like a son and it tore at him to see this great man so down. McCarthy wouldn’t remove Gehrig from the lineup and left it up to Lou. That night Gehrig asked to be taken out of the lineup and McCarthy agreed. At Briggs Stadium the next day, it was announced that Babe Dahlgren would be at first base in place of Gehrig. An unbelieving hush settled over the crowd. As captain of the Yankees, Gehrig brought the lineup card out to the umpires at home plate. He walked back to the dugout to an ovation—a tribute from the fans to a remarkable man. Gehrig went over to the water fountain and, taking a drink, started to cry. He sat in the dugout as the Yankees took the field and for the first time in fifteen years he was not one of them. McCarthy and Gehrig explained to the press after the game. You can take a look at Gehrig’s performance in the eight games he played in 1939. Thanks for sharing this great piece of baseball history. This will forever remain one of baseball’s greatest tragedies. I beleive McCarthy was wrong when he said “Fellows like him (Lou ) comes along every hundred years…….There will NEVER be another “fellow” like Lou. RIP Lou, and God Bless You. I agree with the above comment….Lou Gehrig was one-of-a- kind. RIP Lou Gehrig I know God will welcome you with open arms. I heard this speech as a teenager. Up to this point 40 years later. Still takes my breath away. Lou Gehrig was a class act, a ball player and a gentle man rolled into one. Pride of the Yankees is my all time favorite movie and gave a glimpse of the man who was also referred to as the Iron Horse. Baseball today with all its greed lacks that type of persona. Too bad the world would be a better place. Why all the words about Lou Gehrig, it’s really very simple……using God’s own words……..”There never was, there isn’t one now.and there will never be another, Lou Gehrig !! Lou Gehrig has always been one of my heroes. He was a gentle and courageous soul: a hero to me because he considered himself to be “the luckiest man on the face of this earth”, even though he succumbed so early in life to a terrible disease. I’m 70 years old and in good health. His speech has helped me learn, and understand that I too, am the luckiest man on the face of the earth. We are about to celebrate the 150th anniversary of Lincoln’s Gettysburg Address and just celebrated the 50th anniversary of Dr King’s “I Have A Dream” speech, two of the greatest speeches in American history. I have heard several of baseball’s best announcers refer to Lou Gehrig’s Farewell Speech as baseball’s version of the Gettysburg Address. As an aside, IMHO, Lou’s greatest accomplishment on the field occurred in 1931 when he drove in 183 runs, still the AL record (Hack Wilson of the Cubs set the NL and ML marks the previous season with 190). In 1931, Babe Ruth hit 46 home runs and drove in 123 runs. How could Lou have possibly driven in 183 batting after the Babe?! Truly an amazing accomplishment!! I was born in1929, so I was a little too young to realize what a person and ball player Lou Gehrig was. But since I’m a little older (?) now, I read everything and anything that mentions Lou Gehrig. Gehrig was not just a ball player, He was an institution and a treasure. He did not belong to the Yankees, he belonged to America. Can you even imagine how many young people he mentored, who worked hard to be like Lou Gehrig. I was one of those young people. 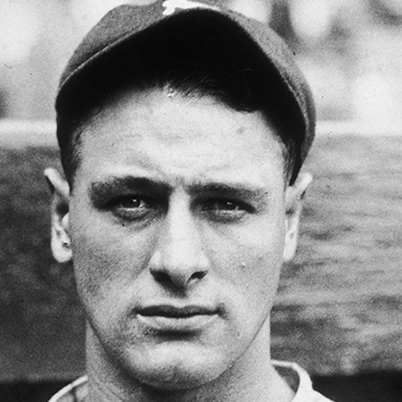 Rest in peace, Lou Gehrig, we really miss you. Lou Gehrig continues to inspire today. I am going through such a ruff patch in my professional carrier that it has affected my daily function. I am surrounded by a support system that is unmatched by anything I have ever experienced in my 60 years. I have friends in numbers beyond imagination. I have colleges, who, through their wisdom reinforce my resolve. I have mentors that keep me grounded. I have a teacher that has been my guide for almost two decades. I have a student who has become the teacher. I have a wife, who for thirty-nine years has been my savior, confidant, my constant, and since 1969, my best friend. I have just learned that I am a perfect donor match for a life saving bone marrow transplant. My big brother is the recipient. I have recited Lou Gehrig’s “I consider myself the luckiest man on the face of this earth” a hundred times in the last few days. . Lou Gehrig continues to inspire. so sad i wish he lived on to inspire more people. I have read Lou Gehrig’s speech many times. His speeches were the same as his bat………….powerful. Tony Camilletti, Sr.
Lou Gehrig was a class act in every way.He will always be an inspiration not only to athletes but to the human race. I will use Lou’s fairwell speech at a template for my retirement address to my associates that I will see for the last time after 42 years. I could not devise a better exit speech if I tried. Lou was one of a kind. Rest in peace with the “Good Lord” Lou. Was nice to read entire speech on the anniversary of the day Lou Gehrig gave his farewell speech. Plus additional history included in your article. I had a great friend and co-worker who also had Lou Gehrig’s disease and it is a brutal and unmerciful attack on a person’s body. Maybe on Future 4th n of Julys, we should do more to raise awareness of the disease. Thanks for article! The text you are using is slightly off, based on the few known recorded parts of the speech. I have gotten the Baseball Hall of Fame to correct their site and will post the corrected version below. Please update your text above. Thanks. “For the past two weeks you have been reading about a bad break. Yet today I consider myself the luckiest man on the face of the earth. I have been in ballparks for seventeen years and have never received anything but kindness and encouragement from you fans. “When you look around, wouldn’t you consider it a privilege to associate yourself with such a fine looking men as they’re standing in uniform in this ballpark today? Sure, I’m lucky. Who wouldn’t consider it an honor to have known Jacob Ruppert? Also, the builder of baseball’s greatest empire, Ed Barrow? To have spent six years with that wonderful little fellow, Miller Huggins? Then to have spent the next nine years with that outstanding leader, that smart student of psychology, the best manager in baseball today, Joe McCarthy? Sure, I’m lucky.